September 29, 2014: Joel Hodgson Explained!!! Feat. Joel Hodgson of MST3K!!! this opening music sounds like a mix of e power biggs, switched on bach, and synergy, what is it really? @eric: I believe that is indeed one of Walter ("Switched on Bach") Carlos' Bach recordings. 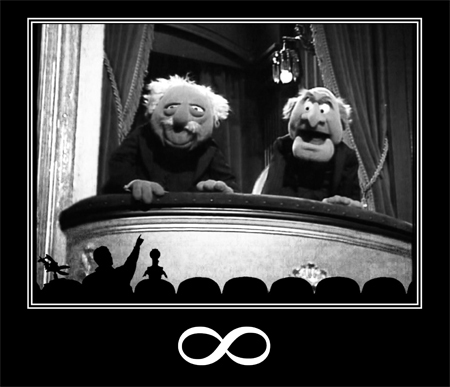 MST3K is the best show ever ! - Joel & the Robots' little silhouettes appear & talk smack about *whatever* you are watching ! The show's regular commenters already post snarky comments on a weekly basis... Speaking of, I haven't seen G yet this week. He hates this show and posts under a fake name every week making fun of it. G - ?!?! ; haven't seen him around for a while ! G is a Smart Baby. Now this is a good interview! Didn't know the show was originally supposed to be post apocalyptic. Also sounds like it could've been an interesting premise. I actually never was the biggest fan of the show, but I really respect the creative POV being shown here. I can't believe how many years straight they put together 22 (or so) episodes a season of a two-hour show. - Great - Thanx All. “I can't believe how many years straight they put together 22 (or so) episodes a season of a two-hour show.” Most of the show was movies. So it was like a radio show. Riffing is not that hard. They did it well. Very true, but still, writing/gathering/recording 700 jokes a week is quite a feat. Another amazing interview with a cast member of MST3K. Great job, guys. Night, People.